Luke Wilson slides in for the Railway. FC Hammers put up a tremendous fight against Premier Division side Old Leake although the third Division side had a disastrous start as they conceded two goals inside the opening 10 minutes. Firstly, Curtis Revell opened the scoring after just two minutes, before a speculative long range from Callum Lawe made it 2-0 - his shot from the edge of the centre circle finding its way into the Hammers net. The underdogs turned the tie upside down on the half-hour mark when they rocked their opponents with a two-goal salvo inside five minutes to bring the scores level. Old Leake bounced back, however, to regain the lead just before the break when Adam Tempest made it 3-2. Although Leake defended their lead well in the second half, the Hammers remained a positive threat throughout. That was until 10 minutes from time when Old Leake finally wrapped up the tie when Curtis Revell scored his second goal of the game to make the final score 4-2. Leverton welcomed Premier title favourites Spilsby Town to Sheepgate and the teams served up a great game for a decent-sized crowd. A lively start saw both sides hit the woodwork twice before Joe Daubney put Leverton ahead when he turned to fire home a 20-yard opener into the bottom corner. Spilsby levelled the tie early in the second half with a superb flying header before they had a second goal ruled out for a foul on the goalkeeper. Extra time saw both sides continue to probe away for the vital breakthrough and Leverton found it on 109 minutes when Nathan Rippin smashed home a 25-yard free-kick which flew in off an upright. Dom Goddard’s tenacity engineered a third for the underdogs when he battled his way past three defenders before scoring to make it 3-1. Spilsby’s response came a little too late when they pulled a goal back in injury time, although there was still time for two late chances to be cleared by Leverton’s brave defence, which had earlier been reduced following the dismissal of Nathan Hubbert, who collected a second yellow card. Benington made the most of their Sports Cup reprieve with a crushing 8-3 third round victory at fellow Premier Division rivals Kirton Town. Having been reinstated in the competition after Ruskington’s removal for fielding an ineligible player in the previous round, four goals in each half saw Benington to a comfortable victory after Kirton had opened the scoring. Tim Bell led the scoring spree with a four-goal haul for the visitors while Matthew Hood bagged a brace. Rhys Cox and Rick Drury completed the Benington tally. In another all-Premier clash, Coningsby comfortably saw off the challenge of Fishtoft following a 4-0 home win. Shaun Boothby grabbed two of the goals while Tom Sewell and Carl Wilson were also on target. Boston College put up a brave fight when they entertained Swineshead Institute before going down 4-2. Nathan Rivett and Jamie Dawson were on target for the College, but Swineshead went through to the next round with goals from Rob Masters, George Bakes, Richard Barker and Bert Snaith. Two goals from Curtis Yeatman helped Railway Athletic through to the next round following a 3-1 home win against AFC Tetford in an all-Division Two clash. Billy Shinn was also on the scoresheet for the home side. The ties at FC Wrangle (v Wyberton Res) and Friskney (v Skegness Town Res) were postponed due to waterlogged playing surfaces. Heckington Millers threw away a 2-1 lead at half time and end up losing 3-2 at Pointon. Pointon took the lead through Sam Husband but were pegged back through an own goal and a Dom Kew strike as Heckington got their noses in front. Jamie Andrews equalised for Pointon with a well-hit free-kick and he provided the assist for the winner with 10 minutes to go, scored by Mason Hardy. Ruskington Rovers enjoyed another victory, this time it was a 3-0 away win at Billinghay Athletic Reserves. Sam Jackson, Ashley Farmer and Matthew Gorman struck the crucial goal for Rovers. Swineshead Reserves had a comfortable 3-0 home win against Woodhall Spa United, to keep the pressure on the leaders. Tom Ebberley, Rhys Holland and Callum Karpyszyn grabbed the vital goals for Swineshead. Fosdyke’s Matthew Scott scored what must be one of the goals of the season at Old Doningtonians, but unfortunately it was the last kick of the game and nothing but a consolation as they went down 2-1. There was very little to pick between the sides and it came down to who put their opportunities away on a very heavy pitch that churned up as the afternoon wore on. Both teams pressed for an early goal and it was Fosdyke who almost took the lead when Matt Bates thumped a header wide from a Zac Chapman corner. Matt Bates then went on a swashbuckling run in to the heart of the Old Dons defence but just as he was about to let loose, a last ditch slide tackle took the chance away and the Donington winger was flying away with the ball, putting in a cross and seeing it finished off at the other end by Jordan Watson. Frustratingly the same sort of thing happened minutes later when Craig Slater followed up a scrambled clearance, pouncing on the ball and unleashing an absolute screamer that was blocked by a defender and from the rebound, another counter attack caught the visitors out and suddenly it was 2-0, Watson again the scorer. In the second half Fosdyke applied a huge amount of pressure and restricted Old Dons to break away chances and they came very close on a number of occasions but couldn’t find that finishing touch. Donington had a goal disallowed for off side but it was Fosdyke who dominated and they were finally rewarded when Matt Scott produced a rocket of a shot from the edge of the box that flew into the top corner of the net. The other scheduled game at Sutterton, where Freiston were due to play, was postponed because of a waterlogged pitch. Kirton Town Reserves started on top against a sluggish Park United and deservedly went ahead after 20 minutes before Park gradually began to compete and just before half time experienced midfielder Chris Wray placed the ball wide of the goalkeeper from six yards out to bring the scores level at 1-1. In the second half the game continued to be evenly balanced until, with 20 minutes to go the game sparked into action when Park substitute Ben Lui scored from close range following a corner. The referee then awarded a penalty to Kirton for a push in the area and the spot-kick was coolly dispatched. The all-important winner came with just five minutes remaining when Alex Limb scored with a side foot volley from a Chris Wright free kick giving Park a hard-fought 3-2 victory. A Leon Creasey goal was enough to give Sibsey the three points following their 1-0 home win against Fishtoft Reserves. Mareham United were just 10 minutes away from victory before Billinghay Reserves salvaged a point in a hard-fought local derby encounter. Aaron Thompson put Mareham ahead 10 minutes into the second half but the visitors grabbed a late equaliser to deny the home side a rare victory. Swineshead A were amongst the goals at Pointon Reserves with Curtis Lane hitting a hat-trick in a thumping 9-1 victory. Mark Sharman (two), Dean Seiner (two), Andy Baker and Jayden Hunt were all on target for the visitors while Pointon’s consolation came from Chris Barnes. 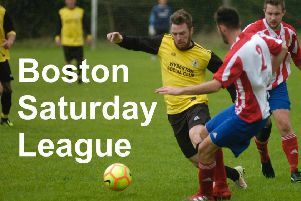 Recent signing Ben Flatters got on the score-sheet for Boston Athletic but it wasn’t enough against an improving Boston Titans outfit who ran in four goals in reply to run out 4-1 winners. The two rival town sides provided a competitive encounter, which was well handled by referee Joanne Hudson, but it was the Titans who came out on top with their consecutive third win in 2016 - all three victories coming on their travels. Matt Howden chalked up his ninth and 10th goals in those recent games with Mike McPhail and Ryan Bristow also getting on the scoresheet. Northgate Olympic were held at home to a 3-3 draw by Benington Reserves. Ryan Frost, Daniel Broughton and Julian Bicknell were on target for Northgate while Benington replied through Lewis Mundt, Dean Stevens and Chris Lawson. Leaders Spilsby Town Reserves were held to a goal-less draw at Spalding Harriers. The point will give The Spalding side a much-needed boost following a run of indifferent results.